Aim: To evaluate the fetal echocardiography findings in high risk mothers referred to Birmingham Women’s Hospital. Method: A retrospective review of all fetal echocardiography performed over a 7 year period (01/01/1997 to 31/12/2003) were carried out. Results: 3428 mothers were referred for fetal echocardiography and a total of 4816 echocardiograms were carried out during this period. The main reason for referrals were: a) previously affected child—27%; b) abnormal initial screening scan—20.6%; c) maternal cardiac condition—9.5%; and d) infant of diabetic mothers—8%. There were 606 reported abnormal echocardiograms (17.7%). The majority of the abnormalities were identified in mothers who had abnormal initial screening scan (61%). In addition, the fetal echocardiogram was also abnormal in 8.8% of cases with increased nuchal translucency and in 6% of infants of diabetic mothers. In those with previously affected child and maternal cardiac condition, the echocardiogram was abnormal in 2.5% and 2.8%, respectively. Conclusion: Abnormal initial screening scans and increased nuchal translucency had the highest yield in identifying congenital heart disease. Infants of diabetic mothers also have an increased risk warranting fetal cardiac screening for congenital heart disease. Normal fetal echocardiogram provides reassurance to the remainder of parents. Aims: Magnetic resonance studies at high field (>3 Tesla (T)) offer theoretical advantages of superior quality images and spectra. Application in the newborn, however, has been restricted due to safety concerns, in particular increased radio-frequency (RF) power deposition, and gradient acoustic noise. Our aim was to demonstrate that brain magnetic resonance imaging can be performed safely at 4.7 T in babies with neonatal encephalopathy (NE) and to explore the potential advantages of high field magnetic resonance R in such infants. Methods: Ethical approval was obtained. Six ventilated infants with NE (mean (SD) gestational age 40 weeks (11 days), median (interquartile range) age at scan 7 (4–12) days) were studied with informed parental consent. The infants were studied in a dedicated magnetic resonance compatible translucent pod, ventilated with a magnetic resonance compatible ventilator (B100, BabyPac) and monitored continuously (skin temperature, pulse oximetry, ECG). Acoustic noise was attenuated by sound absorbing ear-plugs (Earsoft, Aearo, UK), Minimuffs (Natus, USA), and pod lining. Longitudinal (T1) and transverse (T2) relaxation weighted magnetic resonance images were obtained on a whole body 4.7 T system (SMIS MR5000; Philips, Best, Netherlands). Results: Physiological indices were stable and no adverse events occurred. Precautions taken to attenuate acoustic noise reduced maximum sound levels for the infant from 104 dB to <80 dB. Appropriately designed pulse sequences kept the RF specific absorption rate within Medical Devices Agency (UK) guidelines. Reduced contrast was observed on T1 weighted images due to increased T1 at high field. Excellent grey and white matter contrast and differentiation of structures not normally discernible at low field was observed on T2 weighted images (see fig). Conclusion: Using appropriate precautions and safety protocols, high field magnetic resonance imaging appears to be safe in the newborn infant. These are the first newborn cerebral magnetic resonance images acquired at 4.7 T; such studies have the potential to provide new insights into perinatal brain injury. 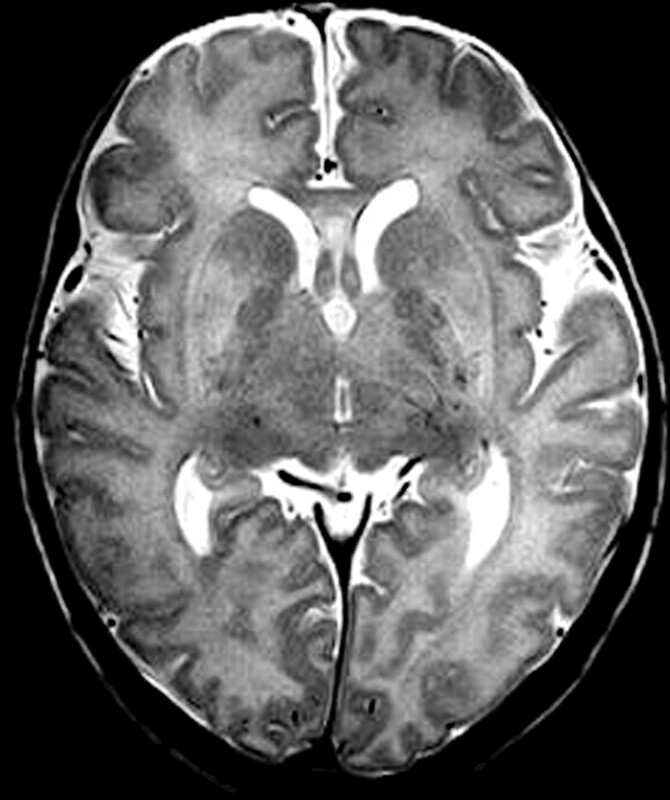 Considerable pulse-sequence and RF coil development as well as detailed neurodevelopmental follow up is required to fully exploit the potential of high field magnetic resonance imaging in the newborn. Aims: To assess effectiveness, acceptability, and safety of current practice. To inform future practice, as many departments have abandoned all sedated neuroimaging in favour of general anaesthesia. Methods: A multi-disciplinary, prospective clinical audit of consecutive, unselected children attending for sedated neuroimaging using a standard data sheet and sedation nursing observation chart from June 2000 to August 2004 is reported. A similar audit of general anaesthesia neuroimaging is underway. Results: Data on 300 (63% male) children aged 2 days to 14.5 years (median 2.0 IQR 1.0–4.4 years), 26% with neuro/developmental disabilities are presented. 8% had CT, 92% MRI. Using Chloral 50–100 mg/kg for those under 4 years (70%) and Quinalbarbitone for older children (30%), 93% of scans were successful and 88% of parents reported the experience was “OK”. 8% of children required airway support (jaw thrust) or other intervention: most in the younger Chloral group. Severe agitation was a problem in 2%. There were no serious adverse events. During the audit we developed a non-arousing sedation monitoring chart for nurses to use. Conclusions: The sedation policy appears satisfactory. Data on a further 150 children who underwent general anaesthesia for neuroimaging are currently being analysed for comparison. Acknowledgements: Many thanks to Ms Sandra Corbett in the Clinical Audit Department, the MRI nurses and radiographers and radiologists and anaesthetists, and all the nurses in Day Care and the other wards, who helped with data collection, and the parents and children who told us how the experience was for them. Aims: To evaluate the incidence of abnormal hip scan findings in a population at risk of developmental hip dysplasia. To assess the outcome of these infants in terms of follow up scans and requirement for orthopaedic intervention. Methods: Retrospective review of case notes of all infants who had a screening hip ultrasound scan performed over a 1 year period from 2003–2004. Baseline data were collected: gender, birth weight, gestation, mode of delivery, and presentation as well as indications for the ultrasound (family history, abnormal examination, neuromuscular disorder, and so on). We traced the outcome of these infants in terms of initial scan appearance (Graf classification), follow up scan if required, and orthopaedic referral rates. We assessed whether certain risk factors were associated with a poorer outcome. Results: 254 babies (5% of live births) had hip ultrasounds performed during the study period. Baseline data showed a mean birth weight of 3055 (SD 38) g, mean gestation 38.3 (2.3) weeks. 46% were male, 54% female infants. Fifty six per cent of babies were delivered by caesarian section, 35% by vaginal, and 7.5% by instrumental delivery. The major indications for the hip screening scan were breech (104 (41%)), family history (62 (24.5%)), abnormal clinical examination (76 (29.5%)), or miscellaneous (12 (4%)). Scan 1: 205 babies (80.7%) had scans classified as Graf 1 and were discharged from follow up. 47 babies (18.5%) had Graf 2 appearance and the scan was repeated after 6–8 weeks. Two babies (0.8%) had Graf 3+ and were referred for orthopaedic intervention. Scan 2: 42 babies (89.3%) had improved to Graf 1 and were discharged from follow up. Four (8.5%) babies had persisting Graf 2 appearance requiring repeat scan, one baby (2.1%) showed Graf 3 appearance on scan and was referred for orthopaedic intervention. Scan 3. Four infants required a third scan and all improved to Graf 1 appearance. Overall, three infants requiring orthopaedic intervention were identified within the group scanned. There was no significant difference in scan outcome in relation to gender, risk factor for scan, or number of risk factors. Conclusion: Nearly 5% of live births in our centre require screening hip ultrasound scans. Initial scanning has a high incidence of abnormal findings (18.5%) but the majority of cases resolve with only 1.2% of infants screened overall subsequently requiring orthopaedic intervention. This is important information as we can then counsel parents more accurately at the time of first postnatal check and hopefully reduce the parental anxiety associated with abnormal initial scan.